INTRODUCTION Akrapovič is the leading manufacturer of premium exhaust systems for motorcycles and performance cars. It is also a leader in carbon parts and the innovative use of titanium. Akrapovič exhaust systems are known for their impact on performance, reduced weight, durability, and sound. Founded by former motorcycle racer Igor Akrapovič over twenty years ago in Slovenia, Akrapovič has grown to international prominence through its successful support of leading racing teams. To date 90 world champions, in all forms of motorsport, have achieved their success with Akrapovič exhaust systems. The company operates out of state-of-the-art factories in Slovenia, employing over 500 people and distributing its products in sixty countries. Akrapovič has form when it comes to offroad competitions. To date over 60 offroad world champions have relied upon our exhaust systems when it really matters. Akrapovič really is the choice of champions. No other exhaust system gives you the same competitive edge: enhanced performance, reduced weight, and real-life competition durability. Akrapovič offers a wide range of premium performance exhaust systems for the world’s top offroad motorcycles. 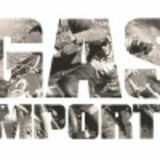 Please also visit our website www.akrapovic.com , join us on Facebook, YouTube, or Twitter. Download our free of charge, iOS motorcycle systems application and also the latest Akrapovič Lifestyle Magazine at the AppStore. All models shown meet FIM noise limits. Products are more durable with a new welded bracket and titanium end cap. Products feature a new coating for the silencer outer sleeve giving better scratch resistance and easier cleaning. New models feature a spark arrestor with no loss in power. Racing is in our blood. Akrapovič has cooperated with and supported racing teams since it was founded. Over ninety world champions rely on Akrapovič when it really counts. In 2014 Akrapovič dominated offroad competitions, with 6 further world championships in MXGP, MX2, WMX, World Enduro Classes 1 and 3 and World Super Enduro. All contents of this Catalogue, including but not limited to the text, graphics, images and photographs contained herein, and their layout (“Contents”) are subject to protection under copyright, industrial property and/ or other rights. The trademarks, including corporate logos and emblems (“Trademark(s)”), are subject to copyright, as well as Trademark rights of either Akrapovič d.d., Malo Hudo 8a, 1295 Ivančna Gorica, Slovenia (“Akrapovič”) or third persons, authorizing Akrapovič to use them. Any reproduction, technical or other manipulation, translation, or other use of the Contents and Trademarks is prohibited without an explicit prior written consent of Akrapovič. Products, product information and their representations are provided for informative purposes only. Discrepancies between the appearance in the Catalogue and the actual products or product information may exist. Akrapovič reserves the right to use additional elements for displaying its products, serving better representation only. 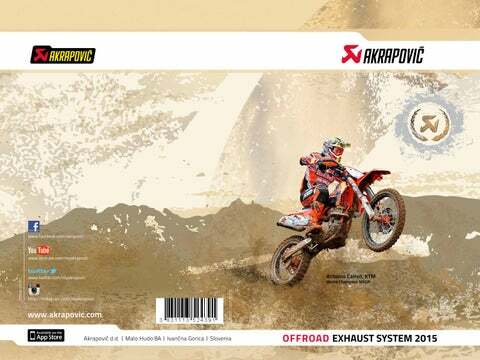 Such elements do not represent Akrapovič products and are not subject to advertising, offer or sale nor does the present Catalogue represent an offer made by Akrapovič. For actual information on specific products, their availability and specifications in each country, please contact Akrapovič or local Akrapovič authorized dealer. Not all products are necessarily available at every Akrapovič dealer. Availability of Akrapovič products is subject to Akrapovič’s discrepancy, mainly based on inventory availability and manufacturing lead time. Akrapovič may at any time and at its own discretion change the design, equipment and delivery specifications, without any prior notice. All Akrapovič products must be used in accordance with the respective user’s guide, with consideration of all safety instructions and precautions only. Akrapovič does not assume any responsibility for printing errors or misrepresentations in the present Catalogue and may change any of the information contained herein at any time. Additional information on Akrapovič products may be found at www.akrapovic. com. Please check our website as we continually launch new products. WARNING / USA: Various U.S. states and the U.S. federal government have individual laws regulating the use of aftermarket exhaust parts and systems, especially as those parts and systems modify, remove, or replace original equipment catalysts. Please consult the appropriate laws in your area before installing any aftermarket part or system on your vehicle to ensure compliance with all applicable laws. Neither Akrapovič d.d., Akrapovič America LLC nor any of their subsidiaries or the sellers of the parts or systems make any representation that any of their parts or systems comply with any such laws. WARNING / California: California laws prohibit the use of any aftermarket exhaust part or system that modifies, removes or replaces original equipment catalysts unless the California Air Resources Board has issued an Executive Order regarding such part or system or unless the part or system is exempted by being used only on racing vehicles on closed courses. Neither Akrapovič d.d., Akrapovič America LLC nor any of their subsidiaries make any representation that any of their parts or systems has received such an Executive Order or that any of their parts or systems conform with the racing vehicles exemption. The purchasers are entirely responsible for informing themselves of applicable California laws and to comply with those laws.